A group of brave Dubliners are currently in South Africa to attend the funeral and other events to commemorate the life of the former South African President, revolutionary and statesman Nelson Mandela. This is their story and their lesson. On July 19 1984, 21-year old cashier Mary Manning was suspended by management at the Henry Street branch of Dunnes stores where she worked. Two days earlier, Mary and her worker colleagues received a directive from their union IDATU (Irish Distributive and Administrative Trade Union) not to handle any products that originated from South Africa. This was as a consequence of a motion adopted at the IDATU annual delegate conference in April 1984. That motion said that because of the apartheid system, union members were to refuse to handle South African goods. Karen Gearon, who was the IDATU shop steward within the store, passed the directive around to her colleagues. When Management at the branch became aware of this directive, they attempted to intimidate the workers into continuing to handle the relevant products but they took no specific measures against staff. However on July 19, that all changed. Management told employees that they must handle South African goods or severe disciplinary action would be taken against them. Despite these threats, Mary Manning refused to handle two South African Outspan oranges that a customer brought to the checkout she was working at. She was immediately summoned by management and given five minutes to reconsider her position. She stood her ground, refused to breach the union directive and insisted to management she would not handle any South African goods. She was immediately suspended. Ten of Mary’s fellow employees walked off the job in solidarity with her. They were Catherine O’Reilly, Karen Gearon, Theresa Mooney, Vonnie Munroe, Sandra Griffin, Alma Russell, Michelle Gavin, Liz Deasy, Dorothy Dooley and Tommy Davis. They were joined the following year by Brendan Barron who worked in the Crumlin branch of Dunnes Stores. So commenced a strike that did not end for more than two years and nine months. 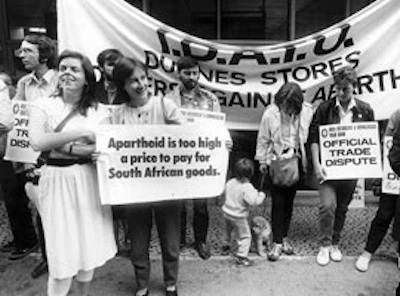 Despite all the odds stacked against them, despite the personal sacrifices that they had to make, they remained united and persisted with their action until the Dublin government finally decided to ban all South African goods from stores in the 26-counties in April 1987. Many of the strikers fell into ill health as a result of the constant picketing outdoors throughout that whole period including times of extreme weather conditions. Some lost their homes as a result of being unable to keep up their mortgage payments. They suffered intense harassment by management at Dunnes, by companies who supplied Dunnes and by the Gardai. Indeed on a number of occasions, some of the women strikers had to get hospital treatment for injuries sustained as a result of Garda and management violence against them. But they refused to be beaten and grew stronger in their determination as each day passed. They took their fight to both the national and international stage, with both Karen Gearon and Michelle Gavin going as far as addressing the United Nations Special Committee on Apartheid in New York. The lessons from this dispute for workers and trade unionists are many. The relevance of these lessons are as important, if not more so, today as Trade Unionism in Ireland is at its lowest ebb in decades. This follows years of capitulation to government and business through the so-called partnership agreements and the recent Croke Park agreement on pay and reform in the public sector. Despite these setbacks, all is not lost. The strike and the resilience of these workers shows us all the vast potential that exists within trade unions and what can be achieved when workers unite and remain united and determined to achieve their aims. It shows how essential the strike, the withdrawal of labour, is for workers. It also shows the necessity of worker and trade union solidarity with others as opposed to just looking after sectional interests. As the motto of the Industrial Workers of the World (IWW) goes, ‘an injury to one is an injury to all’, a line the present so-called ‘leadership’ of the Trade Union movement here in Ireland would do well to reflect upon and act upon. Trade Unionism is about protecting workers in the workplace in terms of their wages and conditions of employment. But it is also about far more than that, something which the Dunnes Stores strikers represented and which the likes of ICTU have long since abandoned. This principled stance taken by these workers revealed the power that they and all workers have and how a strike and trade union solidarity can bring about significant political change. The withdrawal of labour is a tool feared by governments and business alike for they know the power that workers have if they utilise it properly. Sadly it appears that the likes of David Begg and others in ICTU fear it just as much as governments and employers. Let no-one be under any illusion, this dispute played a major role in forcing the Dublin government to ban South African goods, a move that was extremely important in isolating South Africa economically. Two years ago, a plaque was embedded in front of Dunnes’s store on Henry Street to commemorate the strike and the workers who participated in it. Speaking at the ceremony, Kadar Asmal who had been Chairperson of the Irish Anti-Apartheid Movement during the strike and who went on to become a Minister in post Apartheid South Africa delivered a message on behalf of former South African President Nelson Mandela. According to Mandela “young workers who refused to handle the fruits of apartheid 21 years ago in Dublin provided inspiration to millions of South Africans that ordinary people far away from the crucible of apartheid cared for our freedom”. South Africa’s ambassador to Ireland, Priscilla Jana, described the strike as “one of the longest, most bitter and one of the most profound acts of solidarity” in the struggle to bring an end to apartheid. “These brave men and women were in the prime of their youth then. No ego, no glory, no personal gains, just a dogged determination to fight against what they believed was unjust, unfair and inhuman” she said. The strike ended in 1987, more than 23 years ago. But the tactic of boycott remains as relevant today as it did then. While the apartheid regime of South Africa has been long consigned to history, the apartheid state of Israel continues to deny human rights and freedom to the Palestinian people. Palestinian civil society, including trade unions, have called for a campaign of Boycott, Divestment and Sanctions (BDS) against Israel, similar to that which played a large part in bringing the South African apartheid regime to an end. In recent years ICTU have adopted numerous resolutions demanding a boycott of Israeli goods in solidarity with the Palestinian people in their struggle for an end to the Israeli occupation and the creation of a Palestinian state. Now those words need to be followed up by actions similar to those of the Dunnes Stores workers in 1984. So following the death of Nelson Mandela, and almost 30 years on from the commencement of the Dunnes Stores strike, let us remember their sacrifice and bravery. But let us also commit to ensuring that the boycott of Israeli goods is now stepped up until sanctions are imposed and the Palestinian people secure their freedom. The Dunnes stores strikers made a difference in relation to South Africa. We can now do the same for the people of Palestine.